Bushnell 780080 Elite 20-60x80 ED Glass Spotting Scope 780080 FREE SHIPPING! The Bushnell Elite 20-60x80 spotting scope features their most advanced optical technology to provide a high-definition image even at extreme distance, making it the perfect option for important surveillance operations. It can also be adapted for telephotography with an SLR. Each lens is made from ED Prime Extra-Low Dispersion Glass, which virtually prevents chromatic aberration and provides superior image clarity. Their multi-layer anti-reflective coatings increase light transmission to the eye for improved brightness, and the BaK-4 prisms come with a PC-3 phase coating that increases image contrast. The external lens surfaces feature a Rainguard HD hydrophobic coating that breaks up water droplets for continued visibility in wet conditions. The body is armored for enhanced durability, and includes a retractable sunshade for glare reduction in bright conditions. 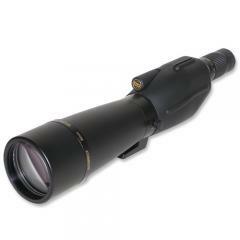 ©2002-2019 CopsPlus.com: Bushnell 780080 Elite 20-60x80 ED Glass Spotting Scope 780080 FREE SHIPPING!